Dedicated to the care of hermit crabs worldwide. This area is dedicated to the pioneers who have captive bred crabs, and for those who wish to learn more or attempt it themselves. Also for inquiring about the gender of your crabs. The eggs were still pink when I checked them Friday. I should check again soon, since I have the feeling that they may hatch any week now. I’m still rushing to get the filter cycled. The freshwater bacteria boost did nothing (not surprised), so I’m pretty much cycling from scratch. My order of Seachem Stability just came today, so we’ll see if that makes a difference. Eggs have gotten glossier. I wasn’t able to get pictures (Mama Crab scratched up my hand for my efforts. Man those leg spikes are sharp), but they may be beginning to form black eyes. JoeHermits wrote: Eggs have gotten glossier. I wasn’t able to get pictures (Mama Crab scratched up my hand for my efforts. Man those leg spikes are sharp), but they may be beginning to form black eyes. GAH! They’re already gray! The eyes are small but they’re there. I don’t have much time before they hatch. You may have a week left if you're lucky, but yeah, they might drop anytime now. The Kreisel’s up and functional. The filter and heater are in another container right now. I’ll throw those in before the larvae are added, most likely an hour before or so to get the water to the right temperature. Just checked Mama Crab. Her eggs are gone. I turned the tank inside out looking for them. I don’t know if all of them could possibly be eaten that quickly, but they’re gone. Nooo!!!! I am so sorry. I am so sorry to read this! Makes me wonder if I should try isolating berried females. Not ideal, but it would make it easier for me to catch them if they drop the eggs where they shouldn’t. Just found the eggs. I dropped a few into the saltwater dish. Only a few hatched to give me chubby, dead shrimp. Does that mean they’re immature? I thought they’d be slim. Leaving them sit resulted in the shells dissolving away. They are now less fat and look more like zoea. They look like fetuses with their round heads. Are the heads supposed to be round and translucent when they hatch? I’m having trouble making out any features beyond the head, body, tail, and eyes. 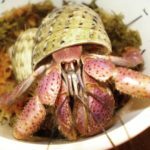 I don’t know enough about hermit crab zoea to tell if they’re too early or too late. Sorry for the poor quality photos. I’m taking pictures through a microscope with an iPhone camera. This is exactly how mine came out, even when I got the female to release in water. They were balled up, and while alive and twitching, they were not able to float on the current. I'm assuming it's a gestational issue with PPs and havr wondered about them being premature/overcooked as well. Healthy zoea are much more shrimp-like - my Es dumped zoea once, though I didn't get to them in time, and even dead they looked the same as other people's live zoea.